Hmm. I wonder where I put Utah. You might be wondering why you're looking at a map of the US when you're at a blog called "Design Dreams Japan." 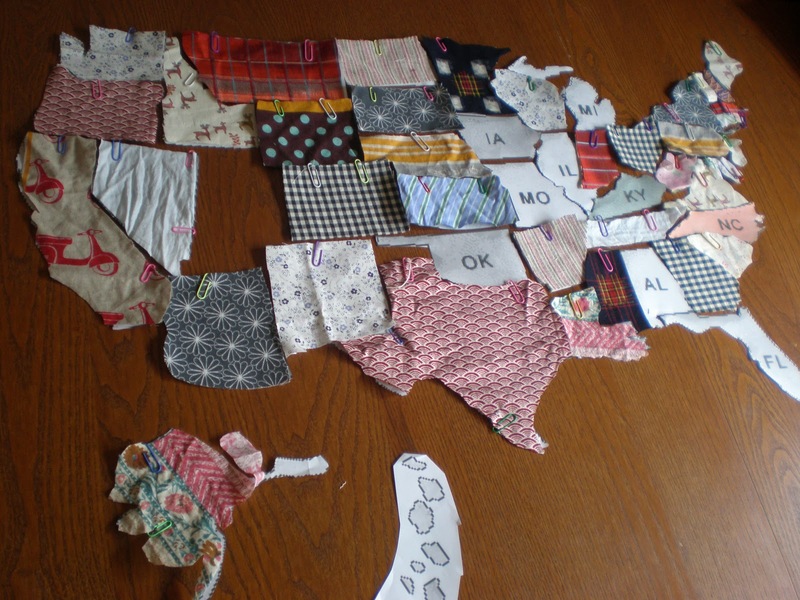 A map of Japan with all the prefectures in different fabric is coming, but I thought I'd start with the US. I'm going to make a quilted map of all the countries we've lived in and visited. Then I think I'll hang a gallery of maps in the hallway. So I have my work cut out for me. This is sort of a 100 yen DIY in that I've used lots of scraps of 100 yen fabric. I'll have a fun non-sewing 100 yen DIY project up next week. Gotta run and iron out Nevada. I'll be sure to post a picture when I'm done! Thanks Heather! We'll see what happens. I've never sewn a quilt before, so this might become more of a quilt-inspired, craft/art, experiment!